Modernist architecture is defined partly by its time period, from the 1930s to about 1970, and modern style also means buildings which are without historical reference to European traditions. For example, the original Wedgwood group of houses, built by developer Albert Balch, were designed by architects Harlan Thomas and Clyde Grainger in Cape Cod and Colonial styles. Those are traditional styles which “referenced” New England coastal villages and even reached back to English cottages. A modernist house in volumetric forms at 9102 32nd Ave NE, built 2016. Modern architecture is without those traditions and instead uses elements of geometric forms and spaces. In modernist architecture, houses may appear as a collection of volumetric forms, like boxes stacked up on one another. Rooflines of a modernist house may be a single-slope or reverse-pitch, instead of the traditional gabled roof form. In the Pacific Northwest School of Modernism, often Japanese influences appear in roof lines, pagoda-like gates and entry courtyards, and rock gardens rather than lawns. 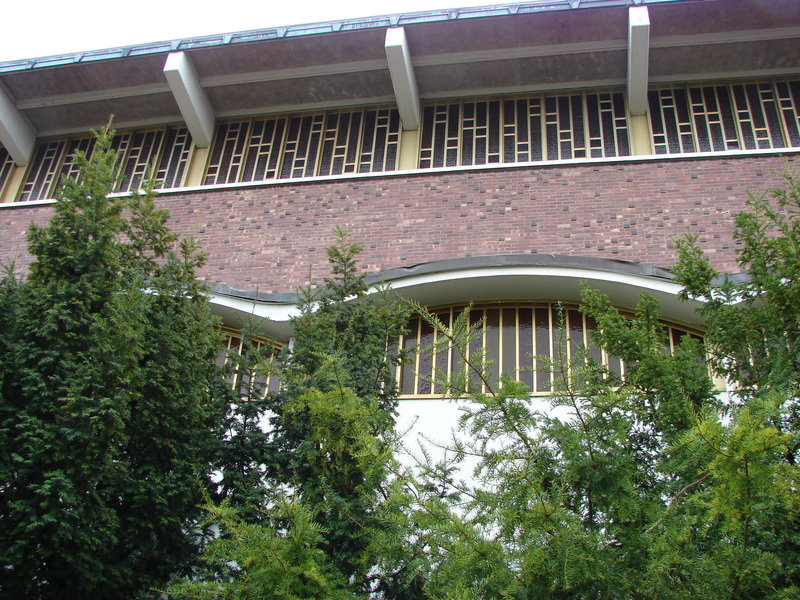 The University Unitarian Church building is an example of award-winning modernist architecture. Two of Seattle’s greatest architects of the Modernist era were Paul Hayden Kirk and Paul Thiry, and Wedgwood has buildings by both. 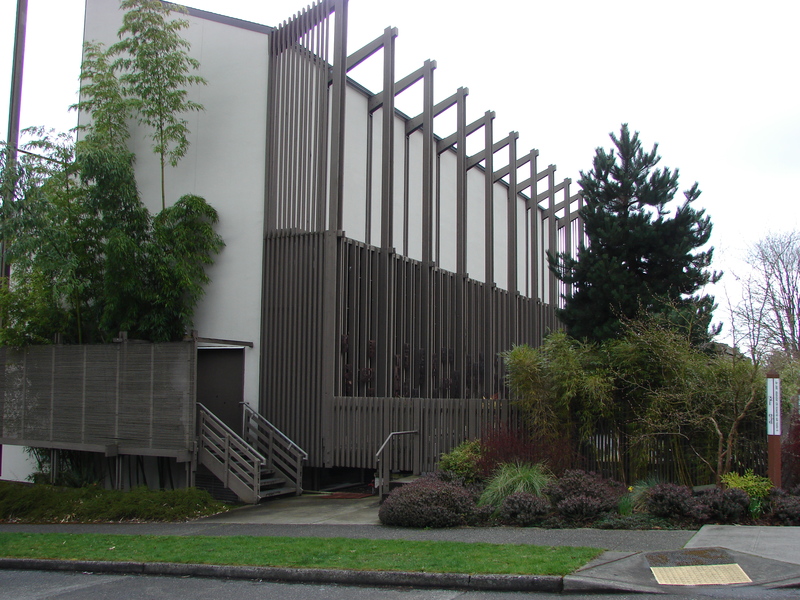 The University Unitarian Church at 6556 35th Ave NE was designed in 1959 by Paul Hayden Kirk, winning him an award from the American Institute of Architects. The side of the church building along 35th Ave NE has a glass screen, letting light into the interior, with a towering exposed-wood supporting structure. The design emphasizes vertical straight lines and long, rectangular forms. “Rectilinear geometry” and the use of natural materials became the signature of Paul Hayden Kirk’s architectural style. In spirit he became joined to University Unitarian Church when he married a member of the congregation, and his memorial service was held there when he died in 1995. 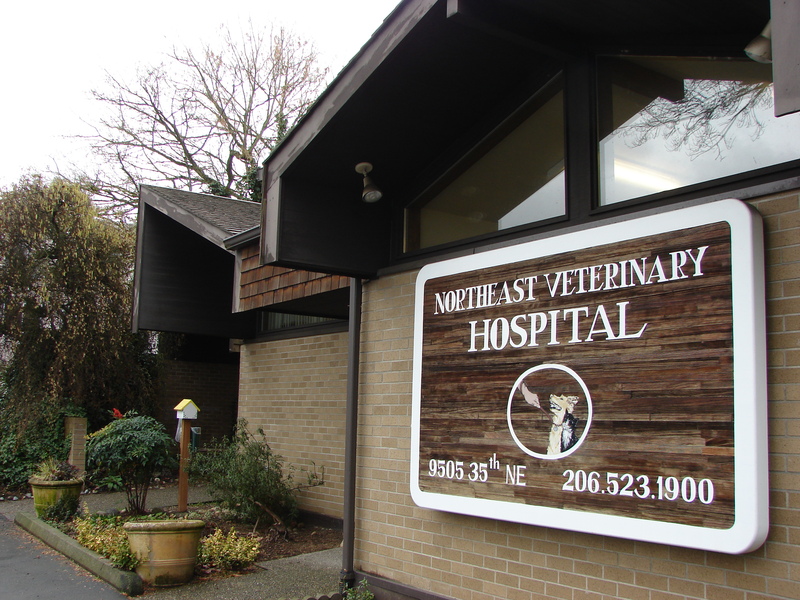 A smaller but still elegant building designed by Paul Hayden Kirk in 1968 is the Northeast Veterinary Hospital at 9505 35th Ave NE. The geometric forms created by the roof lines allow for windows at the top, so that there is light without giving up wall space inside. The peaks and shapes created by the roof lines of the clinic give the illusion of greater height, making the building seem bigger than it really is. This section of the Northeast Branch Library is the original building (1954) by architect Paul Thiry. 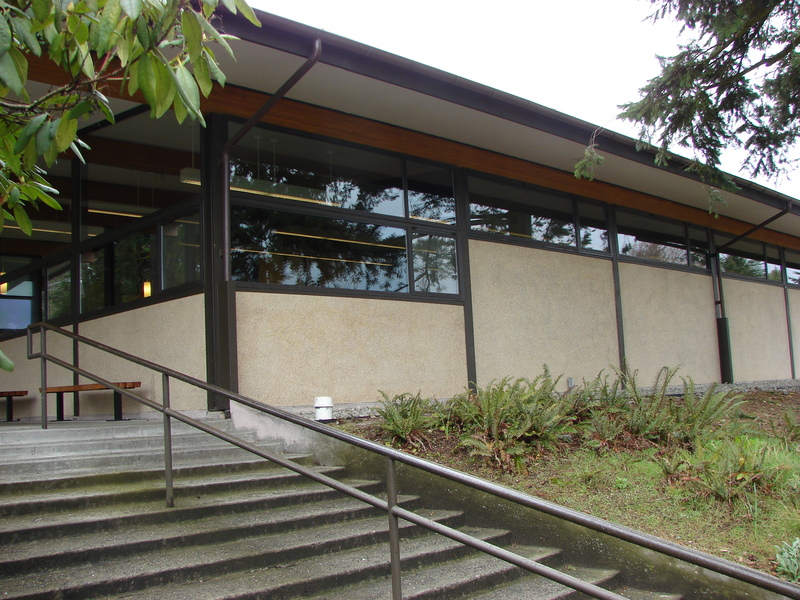 The Northeast Branch Library at 6801 35th Ave NE was designed in 1954 by Paul Thiry (with a 2004 addition by a different architect.) Thiry is known as “the father of Northwest Modernism” because he was the first to do a consistent series of modern buildings in Seattle. Thiry’s designs used abstract composition of volumes and horizontal flow. Sometimes buildings were cantilevered so that they appeared to float. Thiry’s intention was to engage a building with its landscape to make the building appear as an organic element of the scene. Thr present Our Lady of the Lake Church building is the second one on the site at NE 89th Street. It was constructed in 1960 after the first church building was torn down. When Archbishop Thomas A. Connolly asked Thiry to design an office modification near St. James Cathedral, Thiry declined, saying that it would not fit in with the character of the original building. He criticized the purpose of the Archbishop’s office expansion because Thiry did not believe in the addition of “social programs” to the church’s mission. After that incident, Thiry was not asked to do any more work on Catholic buildings. In 1960 the first Our Lady of the Lake Church building which Thiry had designed, was torn down to build a larger one, the present building which was designed by architect Roger J. Gotteland. Modernist architect Gene Zema designed a dental clinic and some private homes in Wedgwood. The Rice Clinic (named for the dentist who owned it) was built in 1961 at 6850 35th Ave NE (southeast corner of NE 70th Street.) The medical-offices building shows the modernist architectural use of volumetric forms: boxes which seem to float in space. Zema achieved this by elevating the clinic entries so that the foundation of the building is not perceived when approaching. This private home designed by Gene Zema has a single-slope roof rather than the pitched, symmetrical roof of a traditional house. In private homes designed by Gene Zema in Wedgwood in 1954, the influence of Japanese roof lines, landscaping and entryways can be seen. The roof definition, because it is a single slope and not steeply pitched, has more horizontal flow to it and lines of different segments of the roof may be asymmetrical. A courtyard rock garden entry with plantings references Japanese homes. 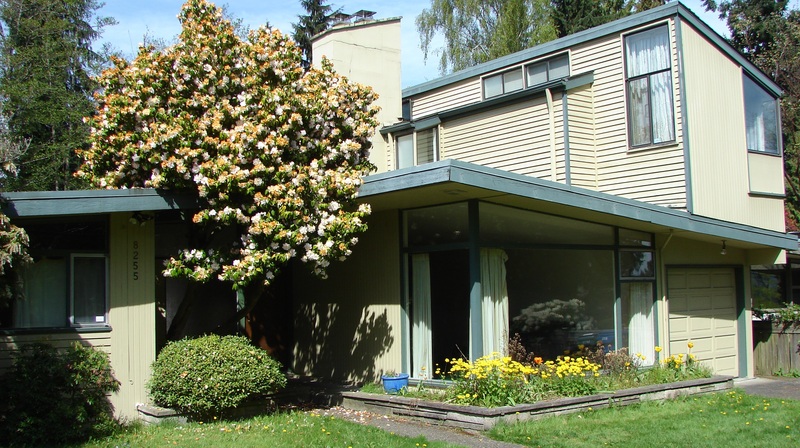 On one of his 1954 houses in Wedgwood, located on 45th Ave NE, Zema experimented with the dormer-style addition of an upper level, meant to give a private floor as a master bedroom or a suite area almost like a separate apartment. Zema used this dormer/partial second floor on later designs in other neighborhoods as well. The house appears as several volumetric forms (boxes) stacked up at asymmetrical angles. Windermere Real Estate office in Wedgwood at 8401 35th Ave NE. 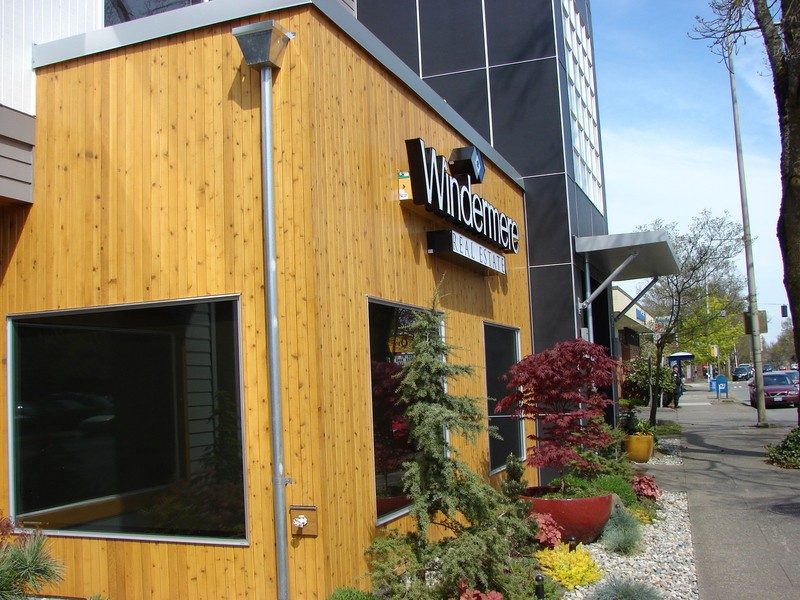 The newest modern-architecture commercial building in Wedgwood is the recently remodeled Windermere Real Estate office at 8401 35th Ave NE. Gene Zema, Architect, Craftsman. Grant Hildebrand, UW Press, 2011. HistoryLink Essay #9383, “Paul Thiry”, by Marga Rose Hancock, April 10, 2010. Lecture notes: “Modern architecture in Seattle,” Prof. Jeffrey Karl Ochsner, Seattle Public Library, April 21, 2012. Shaping Seattle Architecture: A Historical Guide to the Architects. Jeffrey Karl Ochsner, editor, University of Washington Press, 1994. Essays on Paul Hayden Kirk and Paul Thiry. Photo credits for this article: all photos by Valarie. This entry was posted in Architecture, Houses and tagged Gene Zema, Our Lady of the Lake Catholic Church, Pacific Northwest Modernism, Paul Hayden Kirk, Paul Thiry, Roger J Gotteland, University Unitarian Church. Bookmark the permalink.